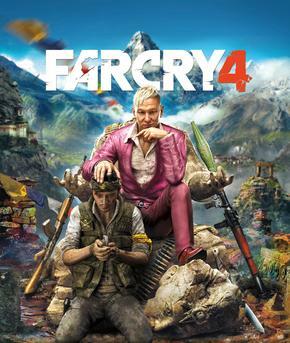 Far Cry 4 is an open-world, first-person shooter video game developed by Ubisoft. Far Cry 4 can be played on PlayStation 3, PlayStation 4, Xbox 360, Xbox One, and Microsoft Windows. Far Cry 4 is the next version of the 2012 video game Far Cry 3, and Far Cry 4 is the fourth version installment in the Far Cry series. Far Cry 4 was released on November 18, 2014. Far Cry 4 starts in Kyrat, a fictional Himalayan country that has sprawling mountains and forests, vast water systems, and villages. The protagonist of the main story is Ajay Ghale, a young Kyrati-American boy, he is caught in a civil war between Kyrat's Royal Army, controlled by king Pagan Min and a rebel movement called the Golden Path. Far Cry 4 focuses on combat and exploration i.e. players fight with enemy soldiers and dangerous wildlife using a wide variety of weapons, completing side missions, collecting useful items, and progressing through the game's main story. Far Cry 4 features most of the elements found in role-playing games, such as an interesting story line. In addition to Far Cry 4's campaign,Far Cry 4 features a map editor, a multiplayer mode, and an asymmetrical competitive multiplayer mode which was developed by a company called Red Storm Entertainment. I have played the PC version of far cry 4. Far Cry 4 is really a very good game with very high graphic performance, for playing Far Cry 4 you must have a good graphic card. Far Cry 4 costs around 1000. Far Cry 4 is a must play game. Far Cry 4 is not soo expensive and has a good story. I hope you like playing Far Cry 4 and I would like you to post the review of Far Cry 4 in the comments section below.